Professional Audio software (ProTools, Logic, Sound Forge, Live, etc). Outboards and analog/digital Mixing Desk techniques, Analog & Digital recording techniques (Live & Studio), Microphones position techniques. Experience of medium/large theatre productions including ballet, musical, cabaret and classical chamber music. More than ten years of studio experience on analog and digital recording equipment for classical, jazz, pop, dance and electronic music productions. Recording Studios planning, wiring, rigging and installation. Management and Maintenance of sound & light equipments with good electrical knowledge. DJ with more than 20 years of experience. Freelance Sound Engineer setup & operate for events, meetings & video conferences; for clients such as: Deutsche Bank, Sony, etc. Freelance AV Technician setup & operate for a variety of events (meetings, conferences, etc) such as Olympia ACCOUNTEX 2012, etc. Freelance AV Technician for a variety of events (corporate, parties & exhibitions) for a wide range of venues such as: Royal Albert Hall, Tate Modern, British Museum, Victoria and Albert Museum, Science Museum, Somerset House, Church House, BBC studios, ITV, SKY, Emirates Stadium, Olympic Park (IBC), O2 Arena, etc. Freelance AV Technician & Rigger for a variety of events (exhibiotions, corporate, parties, etc) for a wide range of venues such as: Westminster Central Hall, Natural History Museum, Museum of London, National Portrait Gallery, Wembley Stadium, etc. 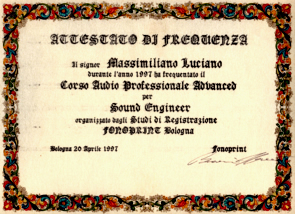 Sound Engineer, Editing and Mastering for the CD “Partenope” by Luca Luciano.